THIS film based on an actual and botched operation by Navy SEALS to kill a Taliban heavyweight called Ahmed Shah in the mountains of Afghanistan gives the game away with its title. One expects a solo survivor, and given the cast, one knows it would be Mark Wahlberg. What one is not prepared for is the unflinching brutality of the war it depicts, or the way it casually intersperses this with what goes for serious chatter. The four SEALS (apart from Wahlberg, played by Kitsch, Hirsch, Foster) run into trouble soon after they have been dropped into Afghanistan. An elderly goatherder and two young boys discover them and the four face the choice of either killing them or taking the risk of having the Taliban on their heels. After a heated discussion about how it would look in the papers and on TV if they killed three unarmed people, particularly boys, versus ‘we decide here, who are they to tell us?’, they let the three go. In his book on which the film is based, it’s clear that Marcus Luttrell (Wahlberg’s character) blames such bleeding-heart liberals for what happened to him and his team. 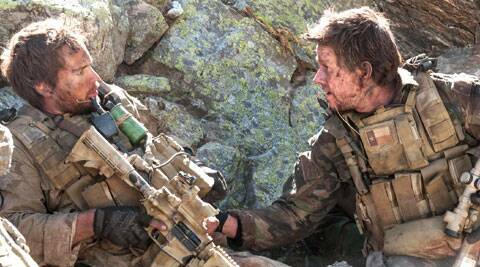 However in Lone Survivor, the scene is almost comical in how it plays out. As soon as the three are let off, one of them goes scampering down the mountain slope to tip off Shah. Berg captures his descent in slow motion, and it’s almost scary to see the boy in his flimsy shoes treat those rocky edges with impunity. It gives a nice idea of how the Americans continue to find themselves outplayed in the same terrain, particularly when the four SEALS are battered against the same rocks. Berg (The Kingdom) turns an unsparing eye on the close shootouts, injuries, bombs, particularly the excruciating falls that the SEALS endure. The sound mixing has earned the film an Oscar nomination and, both in the silent waits and the sudden violence, Lone Survivor bristles with unending torture. However, this is an unabashed patriotic ode to the valour of the American troops fighting an impossible war. Afghanistan — the tribute at the end notwithstanding — is just there.